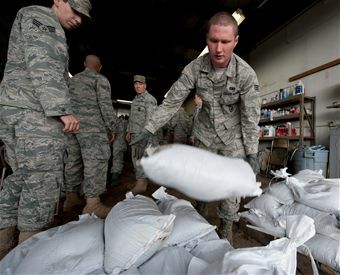 Airmen prepare sandbags during floods in Minot, N.D. this summer. Help is on the way for the nearly 250 Airmen who remain displaced months after historic summer flooding destroyed parts of Minot, N.D.
Secretary of the Air Force Michael Donley on Oct. 23 signed a memorandum that authorized spending incentives to entice skilled tradesmen to Minot to help repair the large number of homes damaged by the flooding of the Souris River this summer. The flooding initially displaced more than 1,200 Airmen and their families. With winter on the way, the need for immediate repairs to prevent more damage is imperative and the main reason why Donley signed the memo, according to 5th Bomb Wing Public Affairs. The memorandum allows active-duty, Guard, Reserve, and Department of Defense civilians with the necessary skill sets outside the Minot area to be reimbursed for travel and per diem incurred during periods of leave taken to volunteer for rebuilding efforts in Minot. North Dakota licensed and bonded tradesmen also may receive funding to travel to Minot to assist Airmen with the repair and winterization of personally-owned homes. If you are interested in volunteering to assist Minot AFB, call the 5th Mission Support Group at 701-723-2205.